The Book Rat: Introducing the January, 2015 #WednesdayYA Book Club Pick! Introducing the January, 2015 #WednesdayYA Book Club Pick! As Liz and I mentioned in our retrospective live show (so fun!) last month, we're kicking off a brand new year of #WednesdayYA book club with a book we *almost* read as the first choice last year! Apparently we have a thing about starting the year off with dystopias... Maybe something about the barrenness of the landscape, or the winter SADs? WHATEVS, this month's book is one I've been wanting to read for a long time, and have heard endless good things! But if you're more comfortable with it, you can also follow along and chat on Twitter, same as always. We'll be manning both fronts, and trying to engage and answer as many of you as possible. We hope to see a lot of you there, whether you're reading it for the first time along with us, or you've read it before and just want to chime in. But if you can't make it, rest assured the video will be shared and available for your thoughts and comments the following day. 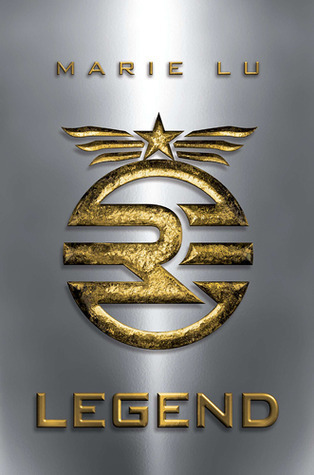 Until then, pick up a copy of Legend and join the #WednesdayYA book club!